Knappily | What’s in a dam? 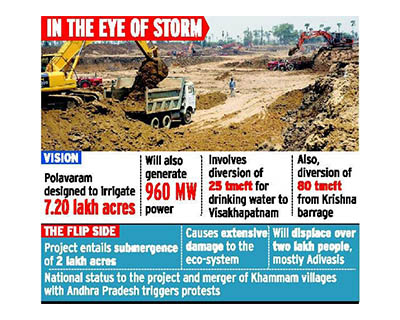 The Polavaram dam was a distant dream for the state of Andhra Pradesh for more than six decades. The project faced roadblocks in the form of techno-economic challenges, lack of clearances and changing political commitment. But, after it was awarded a National Project status by the Central government in 2014, most of those hurdles were removed. Knappily examines the purpose, impact, controversies, roadblocks and the road ahead for this project. What is the current status of the Polavaram project? The government of Andhra Pradesh (AP) is taking all steps to complete the first phase of the multi-purpose Polavaram irrigation project by 2018. It is expected that all works on the right bank canal of the project will be finished by June 2017. AP Chief Minister N Chandrababu Naidu said that he will review the project through Closed Circuit Cameras every Monday from his office and visit the project site every third Monday of the month. He said the dream of 45 years has come true with help from the NDA government at the center. 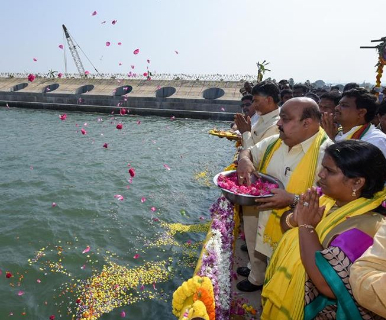 Naidu has also sent a strong message that he would not tolerate ‘any kind of laxity’ among the officials and contractors with regard to completion of this project. Many political parties in Odisha, including the ruling BJD, staged demonstrations last month and submitted a memorandum addressed to President. It said, "The central government has accorded national status to the project and decided to bear all expenses for the construction even as a case is sub-judice in the Supreme Court. It is against the interest of Odisha." Union Petroleum and Natural Gas Minister Dharmendra Pradhan expressed that the Union government was compelled to fund this project as it has been accorded the national project status under Andhra Pradesh Reorganization Act. He backed the Odisha government’s stance that this project undertaken by AP is against the interests of Odisha and said that this project may adversely impact three states - Odisha, Chattisgarh and Telangana. Union Urban Development Minister M Venkaiah Naidu said that the central government can provide funds for construction of the project as the apex court has not debarred it from releasing funds. Submergence of its land: It has been assessed that a lot of area of the neighboring states of Odisha and Chattisgarh will be submerged due to the project [some estimates say it is 4 villages while some say it is 40]. There is no clarity on the extent of damage caused due to this project. No public hearing: As per the executive order from environmental ministry, which kept its previous “stop-work order” in abeyance for a period of 1 year, during the first 3-6 months of this period, the government of AP shall ensure public hearings are conducted in the states of Chhattisgarh and Odisha and submit the outcome of the public hearings to the environment ministry.But no such mandatory public hearing has been conducted in these areas and no provisions have been made to compensate and rehabilitate affected people. 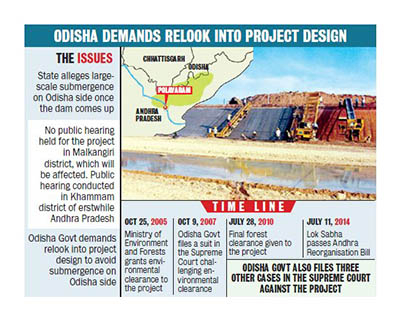 National project status: Odisha has serious concerns as the project was awarded the ‘National Project status; without following proper procedures. According to an exclusive report by Odisha Television, the guidelines of the Union Water Resources Department (WRD) were ignored while awarding national status to the project. In order to grant a national project status, a project should fulfill the eligibility criteria required for funding under Accelerated Irrigation Benefit Program (AIBP) including the investment clearance of the Planning Commission.But no such clearance has been obtained in case of Polavaram. As per WRD guidelines - "On receipt of a proposal from the State government for inclusion of a project as National Project, the ministry of water resources may send a team of officers to the project site with a view to make assessment of the present status of the project and to firm up the plans for its completion in a specified time frame. And also a team should also review the losses that could be on account of the project." But in case of Polavaram no such visit and review were carried out by any team. It is therefore clear that the central government has totally bypassed the prescribed guidelines of WRD in declaring the Polavaram project as a national project. Note: A stop work order is a legal notice requiring employers to immediately suspend all work and business operations. When was the project conceived? Initial proposals: The first conceptual proposal for this project came from the erstwhile Madras Presidency in July 1941. Later L. Venkatakrishna Iyer, then chief engineer in the Presidency's irrigation department, made the first survey of the project site and estimated the entire project cost to be about Rs 65 million. By 1946–47, the estimated cost rose 20 times to Rs 1.29 billion. 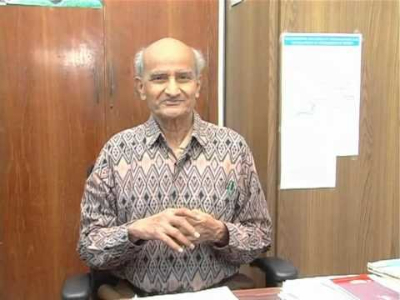 Post-Independence: It was highlighted in the first general election in 1952 by Sonti Ramamurthy, ICS, who contested the election from Rajahmundry. It was named the "Ramapada Sagar Project" since the backwaters of the reservoir would touch the Lord Rama temple at Bhadrachalam. It was later named as Indira Sagar by the Congress. Design: The Polavaram dam was initially planned at full reservoir level (FRL) 208 ft MSL (Mean Sea Level) with 836 tmcft gross storage capacity and 150 MW hydroelectric plant. But the current construction is scaled down to FRL 150 feet (46 m) MSL. The estimated cost in 2004 was around Rs 86.21 billion ($1.3 billion). Indirasagar Polavaram, an interstate project on river Godavari, has been conceived as part of the recommendations of the Godavari Water Disputes Tribunal (GWDT) established in 1969. 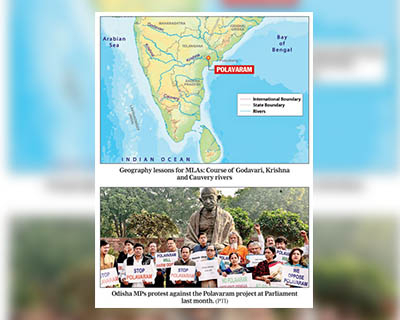 The project implements Godavari-Krishna linking under Interlinking of rivers project. It is located on river Godavari near Ramayyapet village of Polavaram Mandal of West Godavari district in AP. Sharing: The project envisages transfer of 80TMC of surplus Godavari water to river Krishna which will be shared between AP, Karnataka and Maharashtra in proportion of 45 TMC by AP and 35 TMC by Karnataka and Maharashtra as per the decision of the GWDT award. Purpose: The project is a multipurpose major terminal reservoir on river Godavari for development of irrigation, hydropower and drinking water facilities for East Godavari, Vishakhapatnam, West Godavari and Krishna districts of Andhra Pradesh. While Rayalaseema and Krishna basins are deficient in rainfall, Godavari is the most flooded river in South India. This project is to fill the deficit with surplus. Roadblocks: In 1980, the then CM of AP T. Anjaiah laid the foundation stone for the project. It was stalled till 2004, when the then CM Y.S. Rajasekhar Reddy (YSR) got the required permissions. Its progress hit roadblock post YSR’s death. The AP Reorganization Act of 2014 revived the project by according it a national status. Where are the real problems with this project? Huge Displacement and Rehabilitation costs: This project would displace nearly 276 villages and 44574 families spread across AP.Tribals constitute 50% of the to-be-displaced population. It will be a tough task for the governments to provide permanent shelters for them. This will submerge several archaeological sites, coal deposits, a wildlife sanctuary and several hectares of farm land. Constitutional Crisis: The shifting of villages from the submergence zone poses a constitutional challenge. This is because - if the tribal people from a scheduled area are moved to a non-scheduled area, they will lose their rights and privileges granted by the Constitution to scheduled areas. Also, the President’s permission is needed to shift people from scheduled areas to non-scheduled areas.This triggers a Constitutional crisis that involves rights of indigenous people. FRA & PESA: The villages in submergence zone are governed by Fifth Scheduled Area Laws. Another strong legal protection for these people besides the Forest Rights Act (FRA) is Panchayat (Extension to the Scheduled Areas) Act (PESA) of 1996, which can be used to demand scrapping of Polavaram dam. 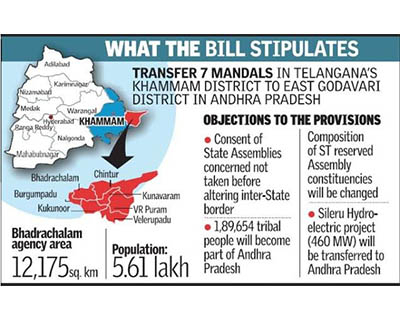 Ignores ethnography: The move to transfer 7 mandals of Telangana to AP to facilitate the unhindered construction of this project is a political step and doesn’t take the ethnography of the tribal communities into consideration. They are closely related to the tribal groups in Telangana, Chhattisgarh and Odisha and not with coastal Andhra. Threat to biodiversity: It will threaten the biodiversity of the Eastern Ghats.The Papikonda National Park, which is close to the dam site, is expected to face submergence of its forests if Polavaram is constructed. Northern Eastern Ghats which is home to several endemic and rare species such as the Golden Gecko, the Jeypore Ground Gecko and the Abbott’s Babbler will have to face consequences. 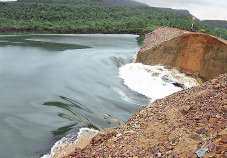 Design downplays flood threat: The dam break analysis reports of Polavaram dam prepared by the AP Government and scrutinized by several Union Ministries are blind to the damaging impact on lakhs of people downstream of the dam in case of an inevitable collapse of the dam for several reasons. If the Polavaram reservoir is at full level and a flood comes from Indravati or Pranhita river and/or major cyclone deposits large amounts of rain water, the dam may give way, and the Arthur Cotton Barrage and Godavari Delta towns will follow. Who have proposed alternatives to the Polavaram dam? Earthen dams are more likely to collapse due to various reasons. Many think that dams do not fail. But it is important to realize that the water behind any dam is a source of hazard of some magnitude which depends upon the amount of water stored and the type of structure used for storage. Nagarjuna Sagar dam and Srisailam dam have not failed during the peak floods of Krishna River that occurred in October 2009. But it doesn’t mean that Polavaram dam also would not fail. This is because the Nagarjuna Sagar dam is a massonary dam and the Srisailam dam is a concrete dam while the proposed Polvaram dam is majorly an earthen and rock fill dam. 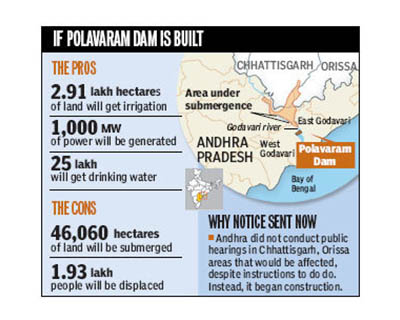 Danger of “dam-breaking”: The supporters of Polavaram argue that when a flood occurs in the river, the areas on either side of the Godavari River will anyway get flooded - with or without the dam. They fail to take note that when a dam like Polavaram breaks, it leaves people with no time to move to safer places. But in the case of the multi barrage proposal the huge incoming flood of 89 lakh cusecs will pass down the structure, as it is, without any obstruction, and hence there is no need to do any “dam break analysis” (as there is no dam). How have various stakeholders responded to this project? The government of Odisha appealed in the Supreme Court (SC) in 2007 against clearances granted by various Central Agencies and against proceeding with the construction of Polavaram dam by AP Government. It termed the Government of AP as defendant no. 1, Ministry of Water Resources as defendant no. 2, Ministry of Environment and Forest (MoEF) as defendant No. 3 and Ministry of Tribal Affairs as defendant No.4 in its suit.The government of Chhattisgarh filed a similar appeal in SC in 2011.But no verdict or stay-order has been delivered by the apex Court so far. Union Government: Under section 90 of the Andhra Pradesh Reorganization Act, 2014, Union Government has taken up the responsibility of providing all clearances and approvals for the project execution and also declared the project as a national project.Also, it was recently announced that Polavaram will be completely constructed at central government’s expense. The government of Telangana: Under section 90 (3) of the Andhra Pradesh Reorganization Act, 2014, Telangana state has already given its approval in all respects to this project. 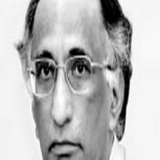 Supreme Court: In 2011, it directed Mr. M. Gopalakrishnan, retired Member of Central Water Commission (CWC) along with Members of CWC to inspect the Polavaram dam and submit a report to it to find out whether construction of this dam is being carried out in terms of the Godavari Tribunal Award. In the reports submitted, it was concluded that the planning of Polavaram project and limited construction activities seen so far by the team at the Polavaram dam site are in tune with the GWDT provisions.